In our mill, we process exclusively grains from controlled organic farming. For your healthy nutrition, we offer organic grains, organic flours and organic baked whole grains under our Naturmühle brand name in 10-kg bags in our mill store. What does (controlled) organic farming mean? 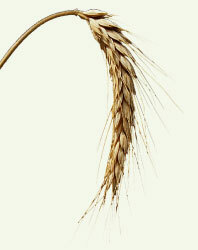 The grain which we process is farmed in an organically-controlled manner. That means that the farmers work their fields by means of diverse crop rotation, natural fertilisers and while avoiding the use of chemical pesticides and mineral fertilisers. By so doing, the soil, the water and the air are protected and the bio-diversity in the fields is increased. By purchasing the Naturmühle products, you are thus making a contribution towards protecting our natural resources and will receive unadulterated natural products for healthy nutrition. What does controlled (organic) farming mean? The term “controlled organic farming” is protected by law and may be used only by farmers and processing companies who are subjected to strict controlling processes. The strict guidelines are prescribed in a directive which is valid throughout the entire European Union (EU-VO 834/2007). Each farmer and each processor who offers products from controlled organic farming is subjected to inspections upon an on-going basis ensuring that the guidelines of ecological farming and the directives are being followed. Only if this can be documented without any gaps and a testing confirmation has been issued may the term “from controlled organic farming” be used. How can one determine whether products have been produced from controlled organic farming? Each company who is subjected to this controlling will be issued an EC control number, based upon which the consumer can recognise that this is a product from controlled organic farming. Our control number is as follows: DE-ÖKO-001. Through our Naturmühle products, you will receive high-quality products which are healthy and unadulterated and make a contribution towards protecting our natural resources. If you should have any comments or suggestions, we would be glad to receive them. If you have any additional questions, please contact our employees.